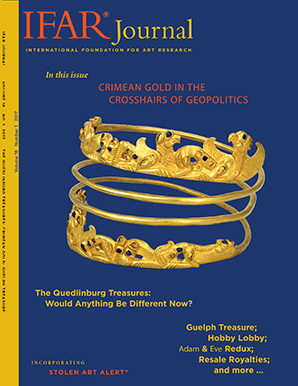 Evelien Campfens, a researcher at the Grotius Center for International Legal Studies at Leiden University, and Irina Tarsis, the founding director of the Center for Art Law in New York, discuss the complexities surrounding a major loan exhibition of ancient gold and other objects lent to the Allard Pierson Museum in Amsterdam in 2014 by five different museums in the Ukraine, including four in Crimea. The exhibition has gotten embroiled in geopolitics. During the loan period, Crimea seceded from the Ukraine, and the AP Museum was left not knowing to whom to return the objects. The issue is being decided in an Amsterdam court. The edited and illustrated proceedings of an April 2017 IFAR Evening recalling the 1990 recovery and related legal battles surrounding medieval objects belonging to a church in Quedlinburg, Germany that were stolen by an American soldier at the end of WWII and sent to his home in Texas. After a showing of a new documentary film about the theft, The Liberators, the attorney for the Quedlinburg church and the museum curator who identified the objects before their return to Germany spoke about the recovery and asked what would be different if the case took place today. Dr. Sharon Flescher, IFAR’s Executive Director, moderated, and Cassie Hay, the producer and director of The Liberators, joined in the panel discussion and Q&A. Dr. Little, the Curator Emeritus of Medieval Art and The Cloisters, The Metropolitan Museum of Art, discusses the historical context and the cultural importance of the recovered objects and also describes two objects that are still missing. Mr. Kline, the attorney for the Quedlinburg church in 1990, summarizes the ethical and legal issues raised in this landmark case and highlights some of the changes in the art and legal worlds in the ensuing years that would make the recovery of the objects different today. Three professors and paintings conservators describe two new tools for studying the material properties of paintings: 1. The University of Delaware/Kress “Technical Art History Website,” which features the art historical, scientific, and art-material research necessary to create historically accurate reconstructions of Old Master paintings; and 2. MITRA (Materials Information and Technical Resources for Artists), an interactive forum that provides information on art materials. A report on the ongoing lawsuit Philipp v. Germany, wherein the heirs of a consortium of German-Jewish art dealers sued Germany for the restitution of the Guelph Treasure (the “Welfenschatz”), a collection of valuable Medieval Christian relics, which, the heirs assert, the consortium sold under duress to the State of Prussia in 1935. The case is being challenged by Germany under Foreign Sovereign Immunity and other grounds. An update on the longstanding lawsuit Von Saher v. Norton Simon Museum of Art, covered extensively in IFAR Journal. In March 2017, the plaintiff, Marei von Saher, filed an appeal to the circuit court focusing on the policy changes regarding Holocaust-era looted art that have occurred in recent years. Three brief updates: 1. In June 2017, Libya formally requested a Memorandum of Understanding (MOU) with the U.S. under the Cultural Property Implementation Act in an effort to protect its cultural heritage from looting. 2. In the case of De Csepel v. Hungary, a WWII-related claim concerning the disputed art collection of Baron Mor Herzog, the U.S. District Court of Appeals in Washington, D.C. affirmed in August 2017 a lower court decision allowing the case to go forward. 3. Also in August 2017, the U.S. Court of Appeals for the Ninth Circuit ruled that the heirs of Lilly Cassirer could continue their claim against the Thyssen-Bornemisza Museum for a Pissarro painting. In an update to a story reported on previously in the IFAR Journal, the U.S. Court of Appeals for the Ninth Circuit will hear a second appeal in the case of Estate of Robert Graham v. Sotheby’s, which concerns the Constitutionality of California’s Resale Royalty Act (CRRA). A discussion of the civil forfeiture complaint filed against the arts and crafts retailer Hobby Lobby to seize thousands of ancient cuneiform tablets and clay bullae allegedly illegally smuggled into the U.S. from Iraq. In a settlement that was filed simultaneously with the complaint, the retailer accepted responsibility for its actions and agreed to forfeit the artifacts. For the third time since 2014, the New York State Legislature has failed to pass a proposed law intended to protect art “authenticators” from lawsuits when rendering opinions about works of art. Stolen items include Alex Katz’s Box Flower 1, stolen from a gallery in Munich, Germany; eight mixed media works by Jacques Mahé de la Villeglé, stolen from a gallery in Paris, France; seven Rembrandt and School of Rembrandt etchings stolen from an auction house in Stuttgart, Germany. Missing items include two paintings by Robert Combas and a painting by Doug Kent. Recovered items include Simon de Vlieger’s Stormy Sea with Ships, looted in Poland during WWII; Norman Rockwell’s Boy Asleep with Hoe (aka Taking a Break or Lazybones) stolen in Cherry Hill, NJ; William Conor’s Bringing in the Turf, stolen in Belfast. Northern Ireland.